Twice a year, we parents are treated with the joyous melodies of our children's chorus, orchestra, and band concerts. While some may not find the squeaking clarinets and violins as music to their ears, I enjoy watching my kids' musical abilities and experiences grow. I am definitely not a musical protégé. I took two years of flute in elementary school, and never mastered reading the music. Though I was in chorus through middle school, there is absolutely no way that you would ever find me singing on a stage these days (though get me in a small room in front of a karaoke screen and I'll belt out any ABBA or Carpenters tune you request!). So when my daughter showed an interest in singing (particularly musical theater), I was in awe. I was way too shy of a kid to ever consider that! She's now in the fourth grade chorus and is trying the violin, too. My son tried the viola for two years (with the same outcome as my flute), and, despite the fact that he detests public speaking, joined the chorus in fifth grade and now at the junior school. Being a part of the school chorus, band, or orchestra, not only exposes them to music that they probably wouldn't load onto their iPod, it allows them to perform in front of a crowd, helps them feel pride in working hard toward a goal, and encourages teamwork as they work together to create a beautiful piece with their fellow musicians. 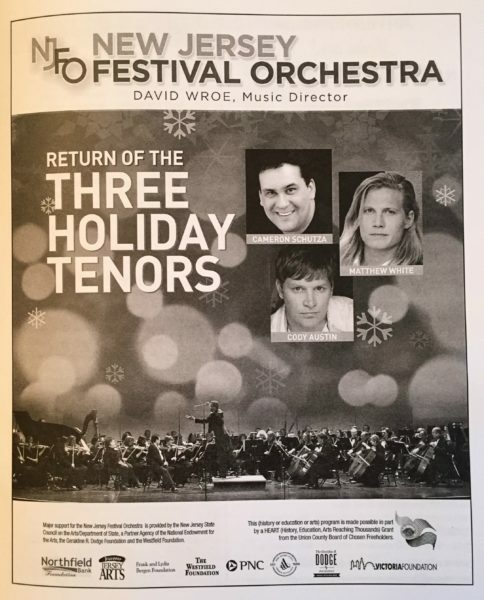 This past weekend, my daughter and her fellow Central Avenue School fourth and fifth grade chorus members, were invited to sing as part of the New Jersey Festival Orchestra's "Return of the Three Holiday Tenors" concert at the Dorothy Young Center for the Arts at Drew University in Madison. This was the second year the chorus has taken part in this concert. Last year, my son sang in the concert with the fifth grade chorus. The venue was beautiful--a 400-seat performance hall which opened in 2005, with wood paneling, velvet curtains, balconies and box balconies. After dropping off my daughter to her teacher backstage, I entered the hall and enjoyed listening to the 48-piece orchestra tune up. The first half of the concert featured the orchestra and three tenors who played and sang beautiful holiday and other songs, including some Latin-style songs and the Can Can (which the audience was encouraged to clap along to). After intermission and a few more holiday songs, it was time for our chorus to join the orchestra and tenors on stage. As each kid, dressed in their concert white shirt/black bottoms (some of the boys even wore suit vests -- adorable! ), filed into his or her position on the risers, you could see their beaming faces looking up in awe around the concert hall. My daughter's face was aglow! Later, when I told her how happy she looked up there with her group, she confessed that she was "really, really nervous"! Though several in the audience were family members of the chorus, most seated around me were not. I loved hearing their "awws" of cuteness as our kids entered the stage. The chorus beautifully sang two songs along with the orchestra and tenors--"Somewhere In My Memory" by John Williams, and "It's a Wonderful Life" by Dimitri Tiomkin (to which they also used sign language). They also sang "Auld Lang Syne" along with the audience in the finale. The kids behaved very well on stage, and all seemed to enjoy the experience. After the show, they all had huge smiles on their faces and excitement in their voices as they found their proud families in the hallways. A beautiful beginning to a happy holiday concert season! Where is Rosie the Reindeer?? ?